2018 Blog - Race Reports etc. Round Two Race Report of 2018 Mitas Tyres Bucket Racing Championship. As seems to be the trend in recent Championship meetings round two was run in a cool day alternating between showers and drying conditions. 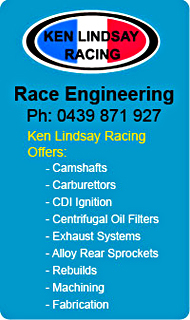 The meeting was run on the GP circuit at Sydney Motorsport Park. Despite the weather conditions the bucket racers produced some excellent racing although due to time constraints only two bucket races was completed. Despite the damp conditions #83 Edward Marsden Honda RS85cr put in a flyer to head up the Motolite field. Heading up the Superlites Junior Murphy put the classic styled #38 Honda CB185 Superlite on the outside of the front row. Track was wet and slippery when race one got underway resulting in much slower lap times.. 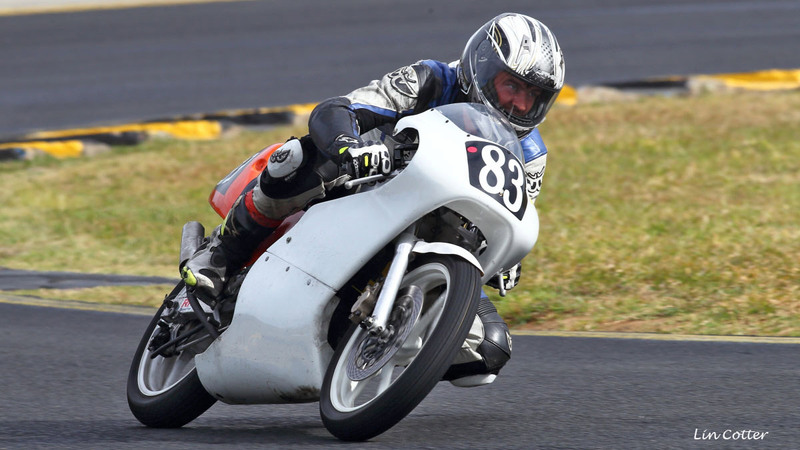 Pole man #83 Edward Marsden Honda RS85cr revelling in the slippery conditions was never headed and won in commanding style from brother Anthony (#86 Honda RS85cr) who hadn’t set a qualifying time and had to start from the back of the grid. Number 17 Adam Cameron (Honda RS CBR150) held second place for most of the race but was relegated to third late on the last lap by the recovering Anthony Marsden. Number 94 John Olip (Moriwaki MH80R) won a race long battle with #57 Stuart Ellis (Yamaha YZF150) they finishing fourth and fifth respectively. Next up #170 Michael Child (Supermono CR85) came in sixth, followed home by #96 Jeff Brown (BBE YamahaYFZR150) and #123 Stephen Bosci (Moriwaki 80). With a much dryer track in race two but with some damp patches lap time returned closer to dry times. 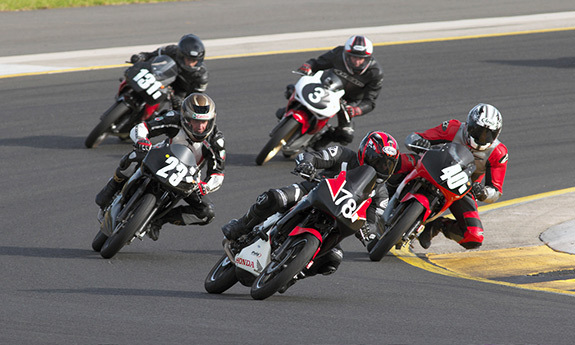 This time #17 Adam Cameron (Honda RS CBR150) got the hole shot and led first time around. On lap two #83 Edward Marsden (Honda RS85cr) took over the lead and opened a slight gap on the others. Number 17 Adam and #86 Anthony Marsden (Honda RS85cr) were swapping places for second and third but #68 Shane Wilcox (Honda RS85cr) spoiled the party to pinch second place on the last lap. Shane had started from the back row as he hadn’t run in Race one. Adam managed to hold onto third with Anthony fourth. Another back row starter and newcomer to Bucket racing #67 Baden Jones (Moriwaki MH80) fought his way up to fifth. #94 John Olip(Moriwaki MH80R) finished sixth ahead of race one sparring partner #57 Stuart Ellis (Yamaha YZF150) seventh. #96 Jeff Brown (BBE YamahaYFZR150) came next followed by #123 Stephen Bosci (Moriwaki 80). The Superlite field got spread out in the wet conditions. #38 Junior Murphy (BBE Honda CB185) won race one with #169 Ian Gregory (Honda CB185) second and #65 Tim Smith (Honda CB185) third. 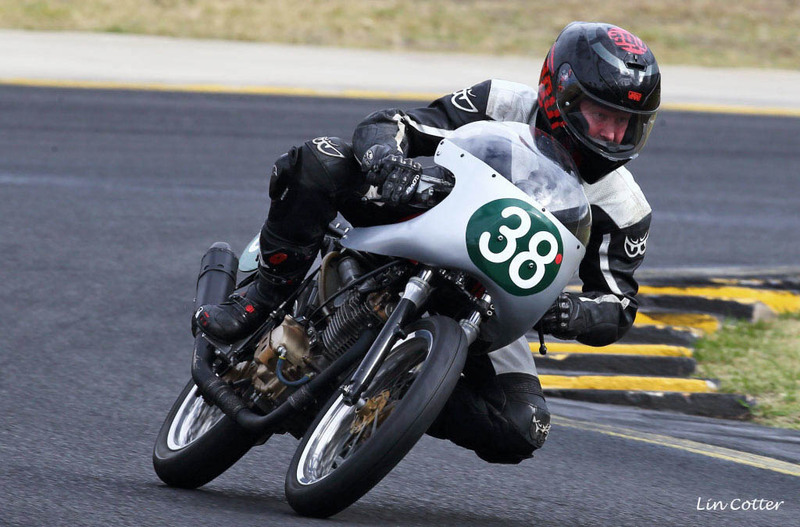 #8 Kurt Wagus (BBE Honda CB185) finished fourth a slipping clutch hampering his progress. With the track drying the pace was closer to dry lap times. Number 38 Junior fluffed the start and had a tardy getaway but quickly recovered to the lead. #169 Ian Gregory (Honda CB185) was battling some handling problems but still held off a charging Tim Smith (Honda CB185). #8 Kurt Wagus (Skyace 185) didn’t start race two due to clutch problems. 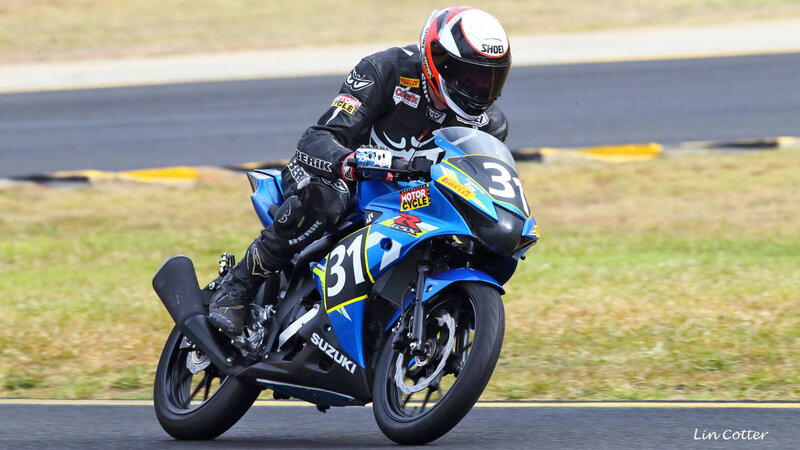 Riding one of the newly released Suzuki GSXR125’s #31 Christopher Dobie not only set the fastest Commuterlite AM qualifying time he also won both Commuterlite AM races scoring maximum points on the day. Number 454 Andrew Collins (Honda CBR125) ran a comfortable second place with #56 Robert Hodgson (Honda CBR125) and #73 Daniel Florance (CBR125) dicing for the final podium position, Robert just getting there on the finish line. Number 272 Nathan Hampson (Honda CBR125) and #37 Luke Young (Honda CBR125) were enjoying a battle of their own finishing just over a tenth of a second apart for fifth and sixth. As with race one #31 Christopher Dobie on the new Suzuki GSXR125 cleared off to win by a comfortable margin over #56 Robert Hodgson (Honda CBR125) who had #454 Andrew Collins (Honda CBR125), #37 Luke Young (Honda CBR125), #11 Barry Young (Honda CBR125) and #73 Daniel Florance (CBR125) in close attendance all finishing in the above order. 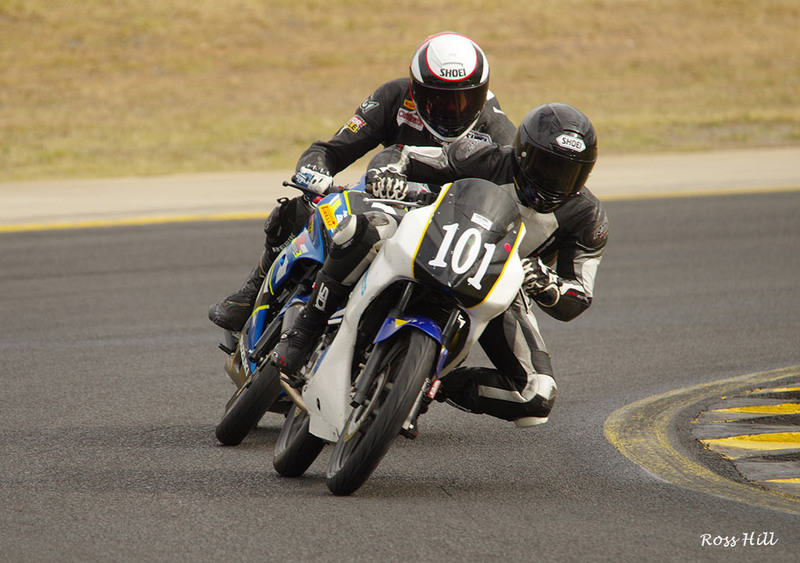 In the Commuterlite PRO class #101 Brad Lumb (Honda CBR125) proved too good for the opposition and master of the slippery conditions winning race one with a comfortable margin. Number 30 Garth Olsson (Honda CBR125) and #49 Gregory Burt (Honda CBR125) were dicing for second and third places with Garth being ahead when it counts. Wet or dry it mattered not to Brad Lumb winning race two in fine style and scoring maximum points on the day. As in race one Gregory Burt and Garth Olsson continued their battle from the first race, this time Greg turned the tables and pinched second place with a pass on the last lap. Number 66 Andy Lewer (CBR125) and #4 Martin Kraaymaat (Yamaha YFZR125) were locked in their own battle with Andy coming out ahead. 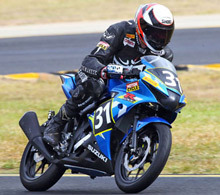 #3 Peter Lindsay (Honda CBR125) had a DNF. 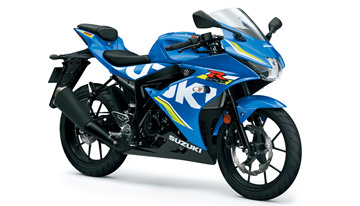 Will this be the bike to topple the all conquering Hondas? 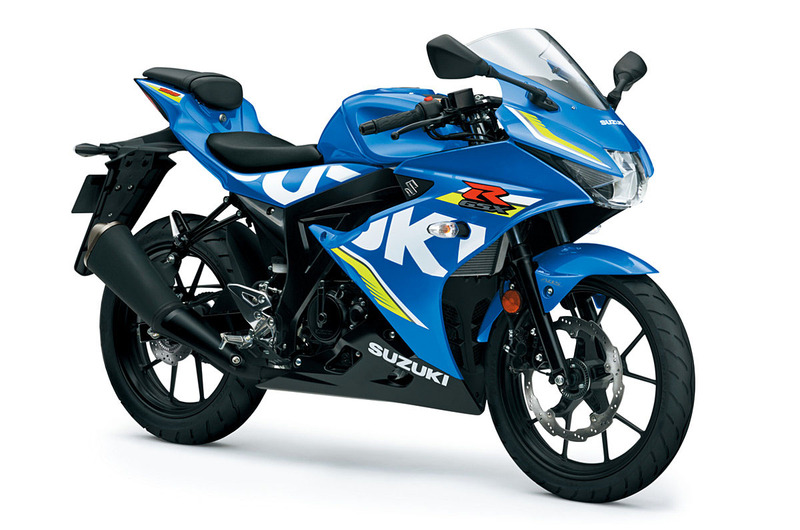 Honda CBR125's have won all the Commuterlite Championships both PRO and AM since the Commuterlites class was launched in 2011. The Hondas have also won 6 out of 7 One Hour Enduro's with the Yamaha Of Steve Kairl and Lorraine Stewart pinching a win in 2015.